Flat Ring Round Riveted Haubergeon 54"
Perfect for early period, pre C11th and even late C14th/C15th with the use of plate armour, when the round riveted maille came back on the scene. European 4-1 Weave - One Flat Ring with Round Rivets to four Solid Flat Rings. Constructed in mild steel with a ring size of 9mm Internal Diameter. Based on examples of original maille, this is proving to be a very popular product for many re enactment groups. Like all of our maille, in terms of total weight it is comparable to original items, although lightweight compared to other products on the market. It is also very strong. Overall, it is perfect for staying ahead on the battlefield when those around you are in need of a lie down. Do you have any questions about Flat Ring Round Riveted Haubergeon 54"? Available in one size. Perfect for early period, pre C11th. European 4-1 Weave - One Ro.. Perfect for early period, pre C11th and even late C14th/C15th with the use of plate armour, when t.. 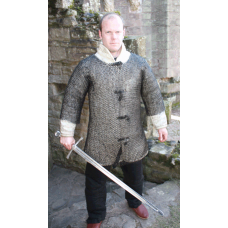 Perfect for early period, pre C11th and even late C14th/C15th with the use of plate armour, w..
Flat Ring Round Riveted Haubergeon 60"
Perfect for early period, pre C11th and even late C14th/C15th with the use of plate armour, when th..